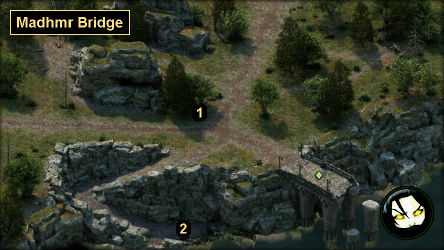 You'll receive this quest from Peregund at Madhmr Bridge (#1). Peregund will tell you that with the bridge out, he set up a ferry service to make some extra coin, but that the strong currents dashed his ferry into the rocks, spilling his cargo. Worse, he'll add that when he went looking to see if anything was salvageable, he was attacked by looters and just barely managed to escape. So he'll ask you to deal with the looters and retrieve his cargo. You can insist that Hanwen and her family stop stealing Peregund's cargo. This will cause them to attack you -- and probably die just as quickly as the other looters. You'll find the Hermit's Hat on Hanwen's corpse, and you'll find the Ferry Cargo in a crate next to the ferry. Then when you return to Peregund, he'll reward you with 600 cp, but you'll take a "minor" reputation penalty with Defiance Bay. You can agree to lie to Peregund and tell him that his cargo washed away. Hanwen will give you the Hermit's Hat for this, and then she and the rest of her family will leave, taking the Ferry Cargo with them. Then when you return to Peregund, he won't give you a reward, but you'll earn a "minor" reputation bonus with Defiance Bay. After completing the quest, Peregund will leave for Copperlane in Defiance Bay, where he'll begin selling traps and Camping Supplies in the market. When you meet him there, if you helped him, then he'll give you a 15% discount on his sell prices. If you helped the looters, then Peregund's prices will be higher than normal.